Already in October 2014 there was first information in my Lets Play projects for a coming computer game, which is the word “simulators” and ” Whose community would take seriously and would not close the technical progress in the game development. Under the name “Project CC”, which was conceived by me but not completely out of the air, there were many other small infopacks in various videos, LIVE streams and the comments, but in the end, chickens need not only cackle but also some eggs. Critical voices questioned whether there was not only a scoundrel on the way, whose holy grail (not my words) would ultimately disintegrate like so many before. 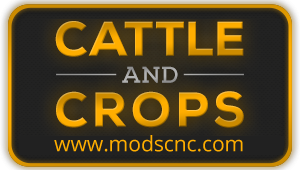 All the more, I am delighted to be able to provide you with this little video and to provide you with 1-2 new, up-to-date information about Cattle & Crops, and hope that the first impressions will also meet your taste; Cattle And Crops is real! Cattle and Crops Tech Demo allows us only to explore open world! Next story CATTLE AND CROPS TECH DEMO – Fixing Bugs! Previous story Cattle and Crops Tech Demo allows us only to explore open world!